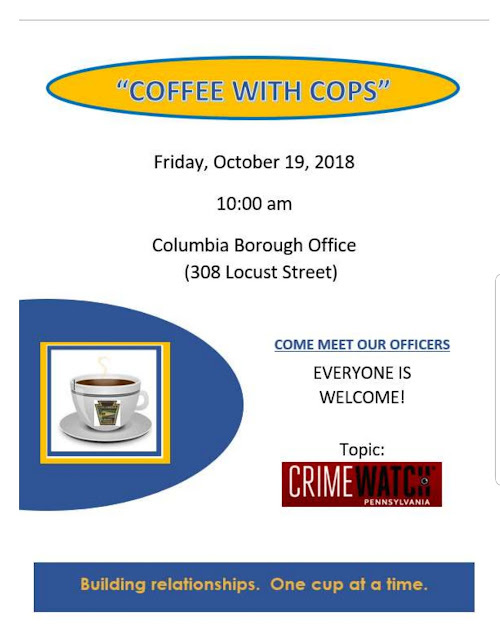 Everyone is invited to "Coffee (and cookies) with Cops" on Friday, October 19, 2018 at 10:00am in the Columbia Borough Office located at 308 Locust Street. Coffee with Cops brings police officers and community members together-over coffee-to discuss issues and learn more about each other. The topic for this session is "Crime Watch". A brief presentation will be given after which attendees with be able to ask questions and mingle with the police officers. We hope to see you there!